Icon EP2 harks back to the pop culture renaissance of the early 2000s—back when people carried first generation iPods without shame and bands like Interpol and The Strokes were producing wildly successful records. Grassfight is Nathan Forster (guitar, vocals), Tamsi New (bass, vocals), and Mark Demiglio (drums). Icon EP2 will be the New York trio’s second EP. In creating music that has elicited comparisons to Joy Division, Interpol, and The Strokes, Grassfight has mined the best of rock’s recent past. In “Look Homeward, Heathen” Forster’s listless call-box vocals remind us of those made famous by Julian Casablancas nearly a decade ago. “Nassau” best showcases Forster’s voice, or rumble rather—which we can place somewhere between the downcast delivery of Interpol’s Paul Banks and the Texan drawl of a country musician (the trio originally hail from Denton, TX). Most of the tracks on Icon EP2 combust with the rage so characteristic of post-punk groups. In fact, the pulsating bass and systematic drumming are what warrant the comparison to Interpol—even more than Forster’s bruised vocals. The EP is also big on crescendos; all five tracks simmer at a low hum but within seconds the propulsive drums and melodic bass begin whirring, setting the stage for Forster’s throaty monotone. It’s almost as if the monotone allows Forster’s band mates to supply the musical variation. Yet even with the ghoulish glamour of their grainy black and white promo video on YouTube, it’s clear that Grassfight could never approach the sepulchral tones of Joy Division or the studied macabre that Interpol occasionally tried to put forth. But here’s why that might not be a bad thing: Grassfight is making itself palatable for those listeners who wouldn’t readily embrace a genre like post-punk and wouldn’t reserve a seat for Joy Division in their musical pantheon. These cardigan-clad boys (and girl) have cultivated a new brand of post-punk. For one thing, their image doesn’t reek of virility: You won’t see them in Italian leather jackets (Casablancas) or matching black suits (Interpol) anytime soon. Grassfight is also unencumbered by the standard rock band woes: they aren’t beset by the imbalance and unwieldiness of a 4+ male rock group, in which everyone but the lead singer recedes into the background. 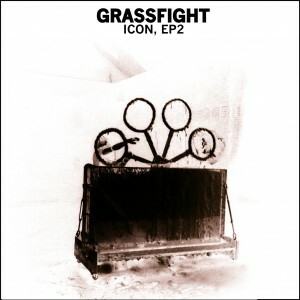 Icon EP2 is a solid effort made more impressive by Grassfight’s economical size. Yet perhaps mastery of form—which only seasoned bands can boast of—will come later.